Apparently Newfield broke the Suffolk County scoring record for points in a season with 518 in 2015. That's a powerhouse offense. Justin Ottenwalder is the next great Newfield HS running back. Just saying -- kid can fly and he trucks people. get out of the way for #48 . #41 Ray Cuiffo was looking down on his Wolverines. The ferocious leader died July 20, 2007 and will never be forgotten. LIC champs, '41'-33. The significance of #41 slammed me as I walked under the scoreboard of Newfield's 41-33 win over MacArthur. Ray Cuiffo was the next great 1. Kuinlan's 33-yard run finishes four-play drive over 58 yards in 1:04. Cassazza makes a leaping interception, then lines up on offense. 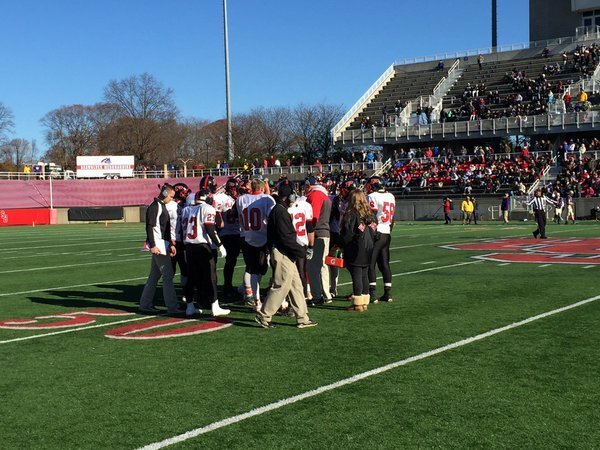 Flynn's huge INT in the end zone sets up Plainedge at the 20. Kuinlan to Mike Johnson for the 2pt conversion.